We are already into week two of #thecultrises. How are you liking it so far? I have to be honest, parts of it are frustrating to me- especially the grey skin of the Acolytes and Aberrants. The good news is because of the accountability of this journey, I'm steadily plugging away. Progress is contagious and I have found it easier to choose to paint over vegging in front of Netflix or playing a game of Battletech on PC. That in itself is tremendous hobby priority progress. 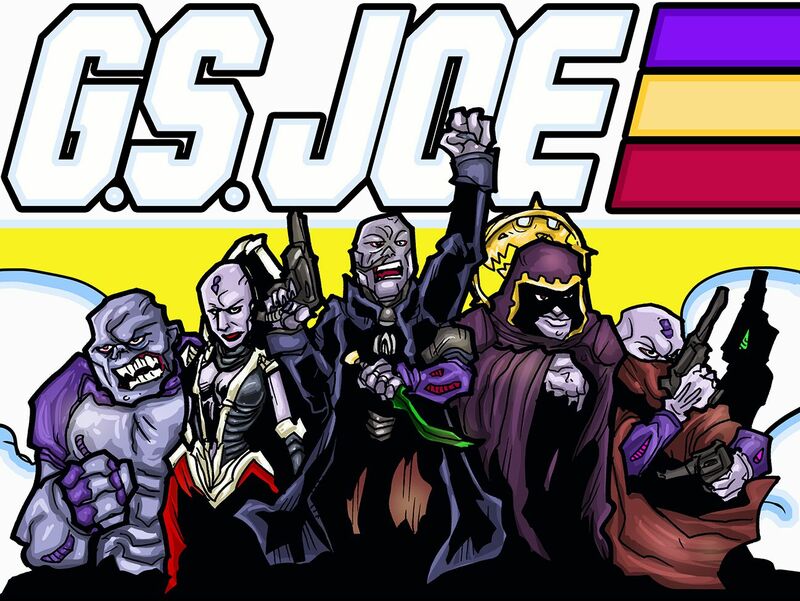 Shout out to Goatboy for creating this epic GSC art for me. For this installment I bring you the Iconward. I have mixed feelings about the Iconward model; on one hand his banner really makes for him to be a centerpiece model for your force but conversely other than the banner there isn't anything else remarkable about him. 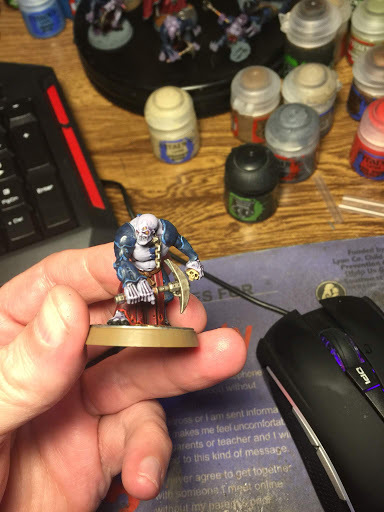 I tried to focus on the banner as the focal point of the model. Skillshade added and base colors laid down. The iconward follows the familiar formula based on the GW how to paint Acolytes tutorial done a while back. The skin is alot easier to do on the Acolytes and Iconward because the recessed areas are alot more defined. Plus they wear pants and shirts, which is usually a plus. I still need to do the blood vials on him. In addition to the Iconward, I knocked out a few more of the Aberrants and a couple Acolytes from the Overkill box that I hadn't finished. You'll notice that they are not based, that is because I am still toying with the idea of prying them off these bases and on to the GW Sector Imperialis bases to match the rest of the army. It's tough with those small contact points, I don't want to break the models. Here is what might be my favorite Aberrant model from the new set. Why do you ask? Well he doesn't have ripped abs but instead has a bit of a beer gut. I feel that I can identify with him more. He could also just have a full stomach from eating the guy whose skull he is carrying. Who knows. I'm toying with the idea of different colored cords on the armor to differentiate units. 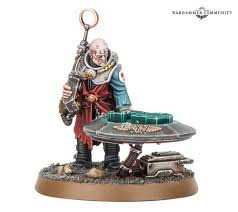 Right now the posts are going to be a bit light on content because I don't want to spend any time on the index GSC rules as the codex will be changing a good number of them I expect and I frankly don't want to waste time talking about it. 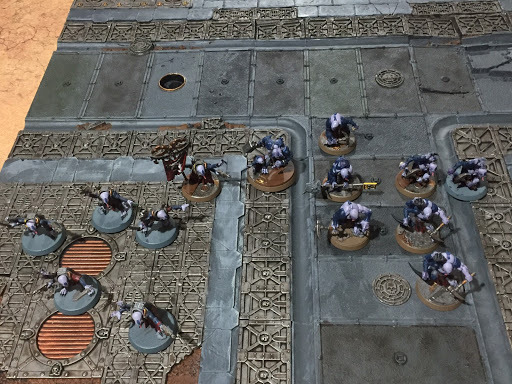 Instead, Let's talk about the design changes that seem to be happening with the new codex. Firstly, the focus on the "Neophyte" class of characters is apparent with the new models in the range; Sniper Girl, the dirt bike riding jackals, the Nexos (who I've decided to call Creedstealer), the Assassins, and others all highlight the (almost)human side of the cult and have created a unique identity for the GSC outside of "Imperial Guard with Genestealers"
1. A new Cult Ambush system- we've heard reports of discussions at the Open Day of a "Blip" System that we can use to get our units into ambush position. I love that GSC have always had a unique playstyle and I can't wait to learn this new iteration. 2. There is a theme of disruption in the GSC lore/tactics, I expect that to be fleshed out. It would be awesome if there were ways to steal CPs from your opponent, sabotage their weapons and other general shenanigans. 3. Love for Acolytes/Metamorphs. I LOVE the Acolyte models and loves using them in 7E, I hope they are once again units that can excel. They were the backbone of my lists. I seriously hope they also buff demolition charges. I'd love for the Acolyte with demo charges to have an option to suicide himself to blow up choice enemy targets. 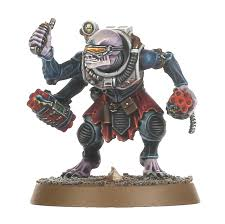 I hope this guy is useful in the codex. He needs a cigar in his mouth though. 4. The models... obviously. I'm not sure why I put this one fourth but the new models are amazing and I can't wait to get my hands on them! 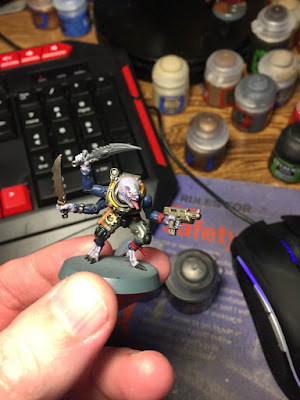 What are you excited for with the Genestealer Cult release? Before we go, it's time for another family picture of completed models on the top part of the display board. Next week- I am still trying to finish up the last of the Aberrants and the remaining seven Acolytes from the Overkill set. 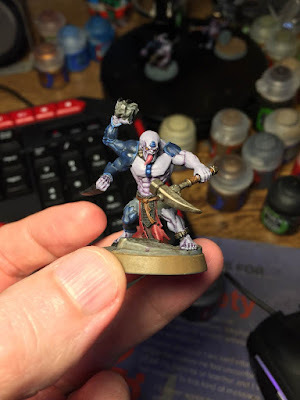 As always, thanks for reading, C&C is always welcome on my painting, this blog series, the podcast, and most everything else! Until next time!